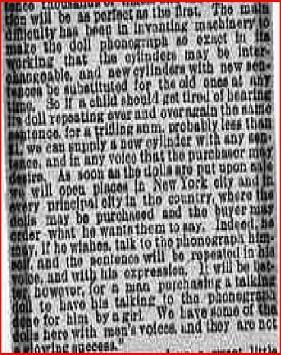 "From the First To The Best"
Other Phonograph Talking Dolls (Below). years and more. Copy of Patent Below Click Here For A Full Copy Of This Patent. Free! Please refresh your page if you have been here before. 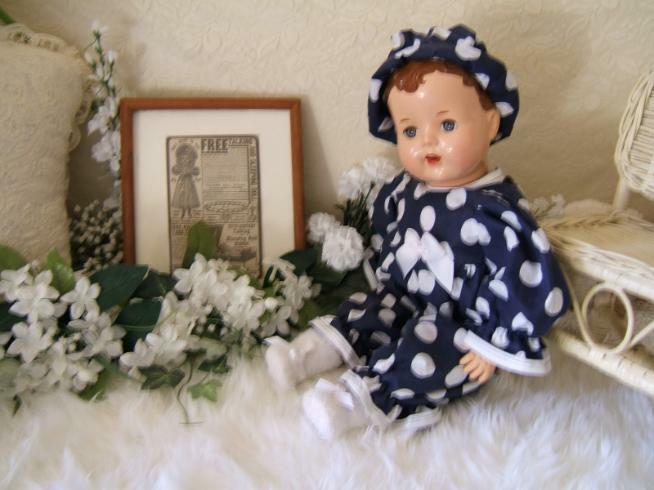 The doll below is a Talking Schilling doll, Click Here for her page. Stamped on the back of the mechanical talking unit is says . 1933 to 1949 is 16 years. Back Of Ad To Your Right..
right than the one I have above. Meaning Color and Text. Picture of the framed ad is below sitting next to the Schilling Doll. Above it what is on the back of the ad to your left. ACME Stoves for sale and other things. 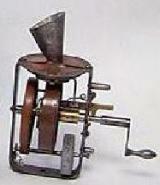 was for sale by the end of 1889 and mass produced by 1890. 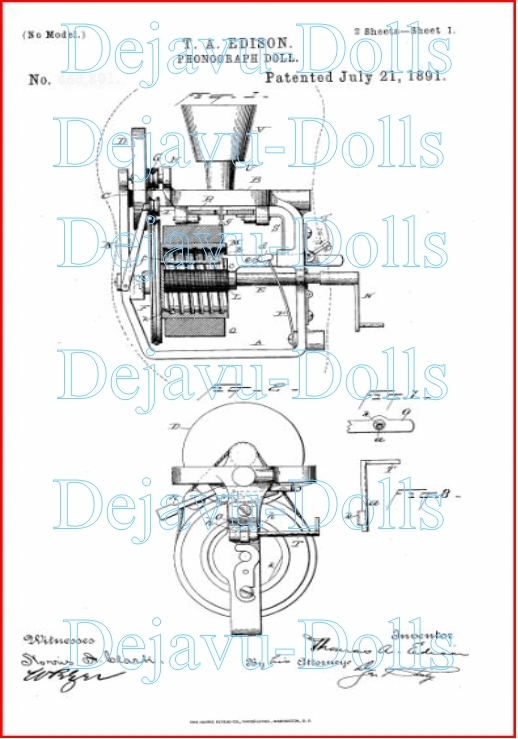 "Phonograph For Dolls Or Other Toys"
Also take a good look at this patent it is defiantly different from the last patent below. Compare the two and you will be able to see they differ a lot I think. 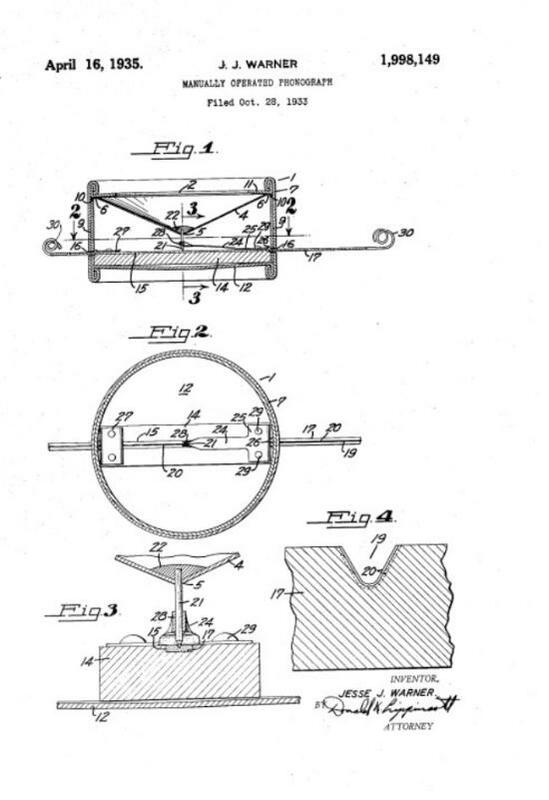 time this patent was even applied for. 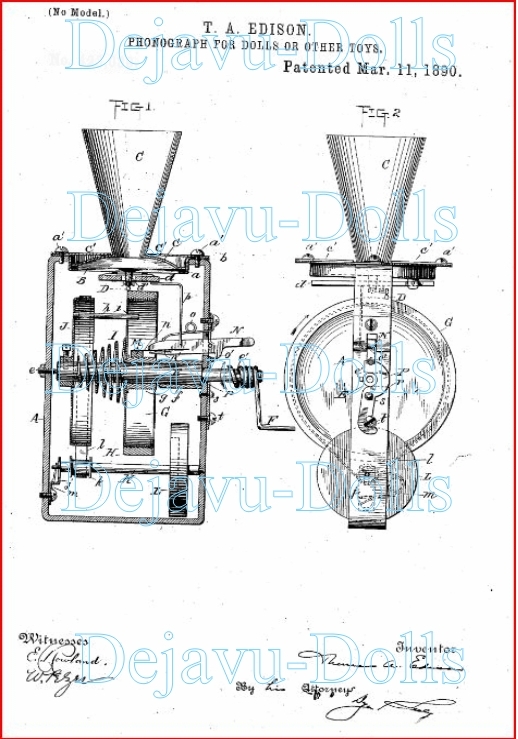 The patent was granted on July 21, 1891. 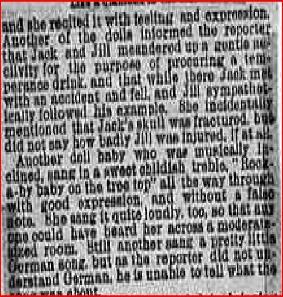 The doll was first sold in 1889. 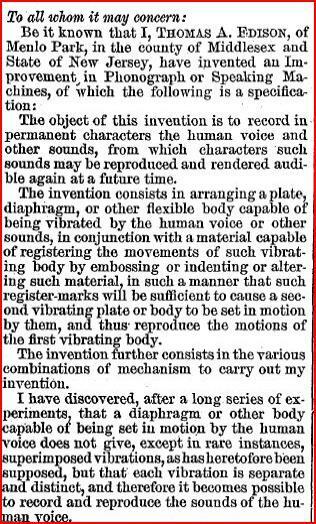 Read part of the patent (below). things...... Anyway if it is out there I will find it. Check Back! 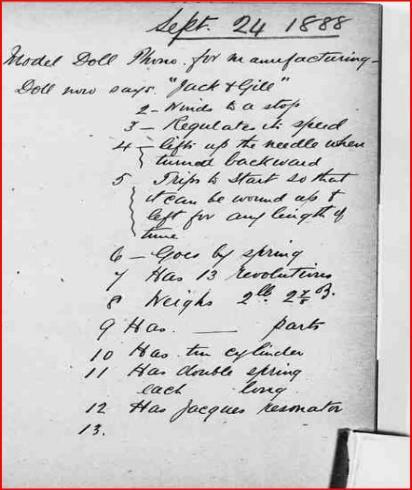 "Doll Certificate" Plus Patents on her. 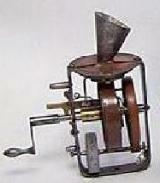 "The Edison Phonograph Toy M'F' & Co."
the top 2 patent. They are both listed in the certificate (right). already in mass production by the time the last patent was even applied for. 1878 date. 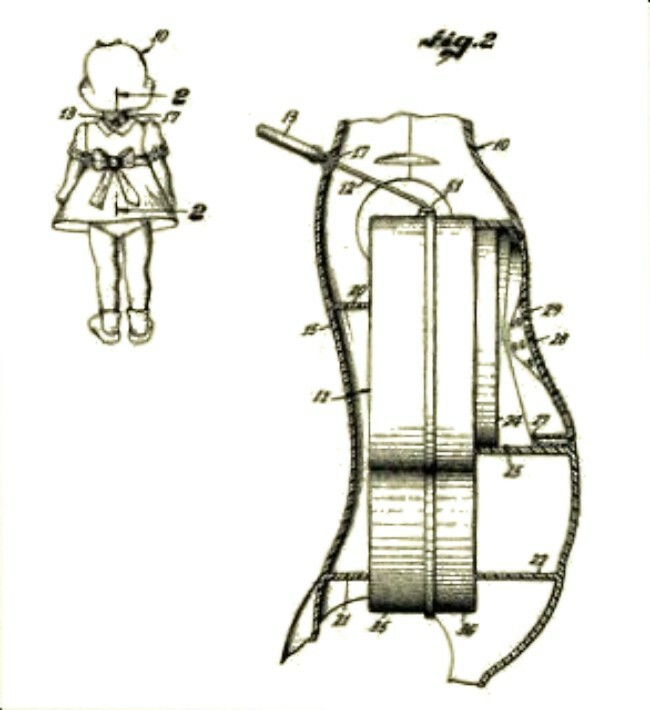 This is just one of the many patents/parts that went into this doll. 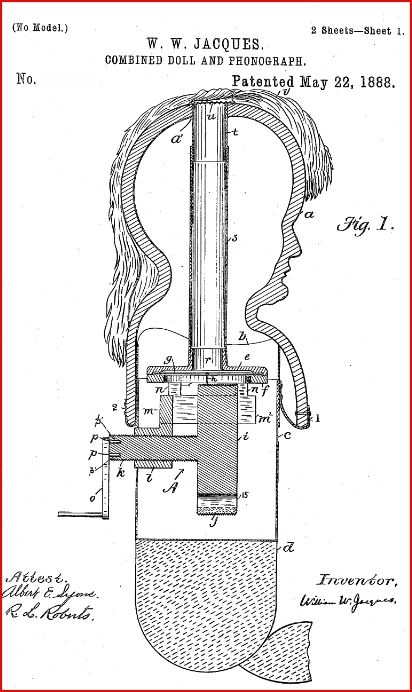 Click here for a full copy of this patent. It is at the very bottom of her page. native language can talk to them. and they are not a glowing success"
I cannot read the very first part of this..
like of which was never dreamed of by them even on Christmas Eve. years ago on this doll. Plus this is all new information you will not find on the web ... well it's not "new" it's new old information. "How in the world did the idea strike you?" Mr. Edison was asked. told that the next president would be Benjamin Harrison and if into the other then Grover Cleveland would be named. been the patent for these heads. Scroll down or Click Here. 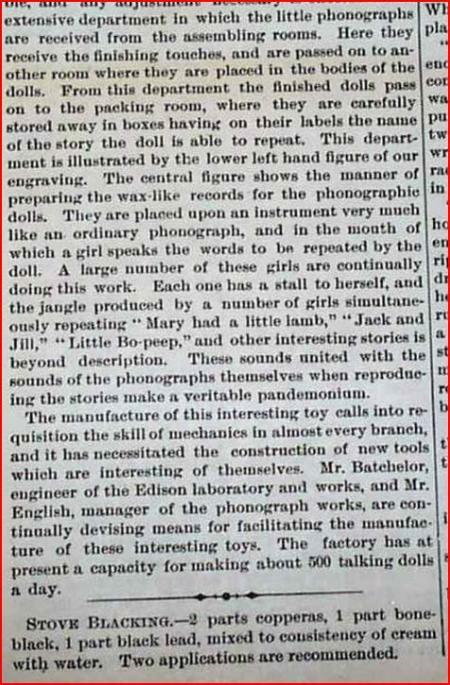 article dated 1890 (below) and the plan was to make 50,000 dolls (news article below). idea evolved (not fact but the dates do match up). 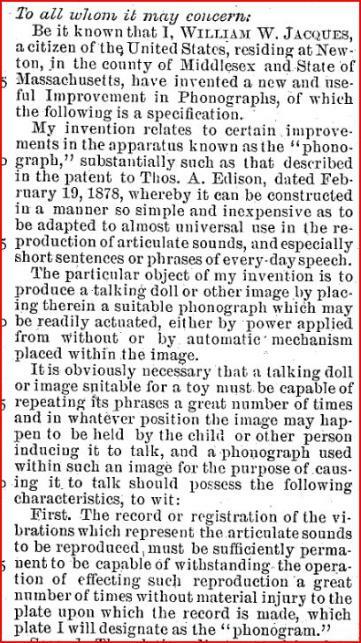 The second patent is dated March 11th 1890 and the last one dated July 21st 1891.
is the second one I have found many pictures of but I have yet to see the last one in any doll pictures at all but I am sure it was made. 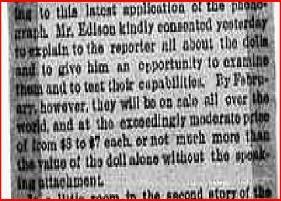 summer of 1887 after he had ordered 2 talking heads made as a Joke/for fun with his friends. 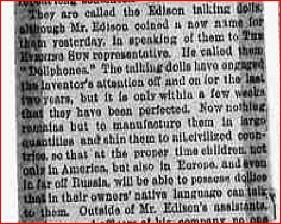 of the dolls were sold and shipped to Europe before that date and some also went to New York's rich and high society people. 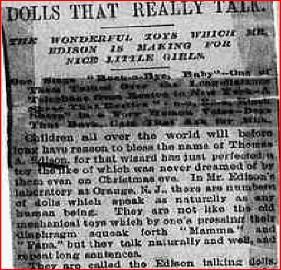 back then, all of New York and all across the country articles were wrote about Edison's talking doll that would be coming out soon. the working class, the everyday middle income people of the time. that is I am sure it got caught up on the dolls clothes so it was removable to untangle it and to dress and undress the doll easier. 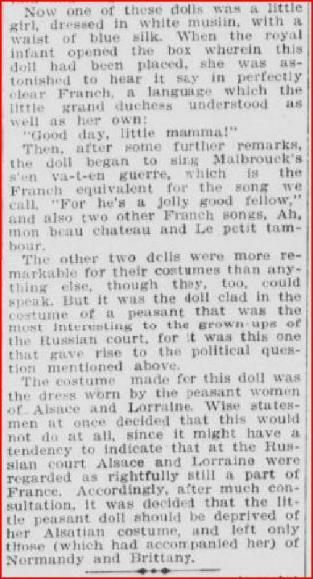 Sun Nov 22, 1888 Click Here it tells of how a reporter listened to a doll speaking/singing in German. beginning! Read the newspaper articles and you decide. biography has to be endless! Scroll Down! Who was William Jacques? First of all I am still researching this information. So it is subject to change as I find out more. the Doll Phone, on line 12 you will read "Has Jacques resonator". 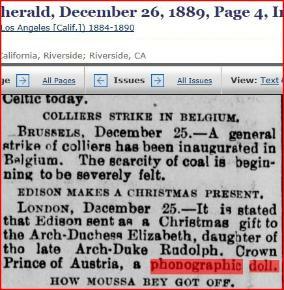 Which in my mind is saying Edison was redesigning the doll, adding to it? Fixing problems? wound up letting go and the doll talks. 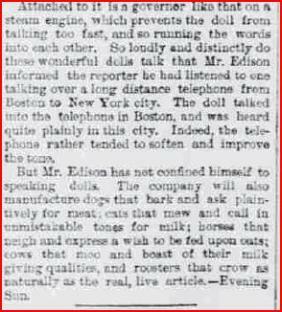 And I would bet this was Edison's idea from the very beginning. 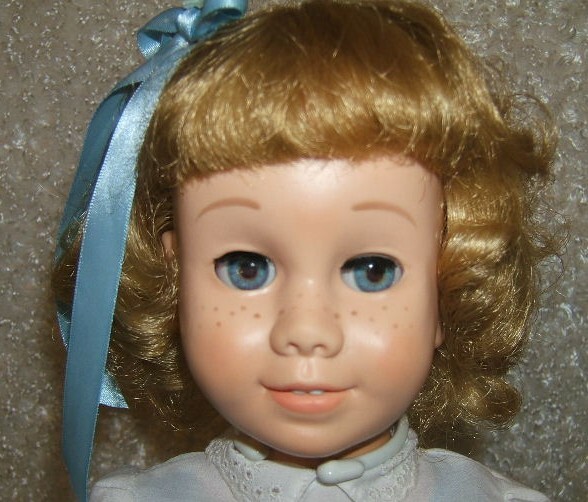 It took another year before the final doll came out. fit inside a doll or figure as he calls the heads in the article above. 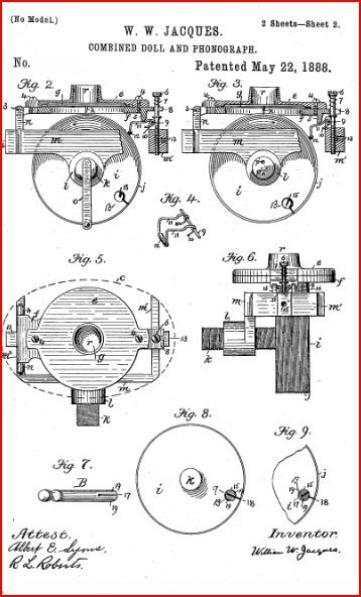 means is when Jacques went to patent this figure he did so under his name because he was the designer but was under contract to Thomas Edison to build the figure/doll. article above. 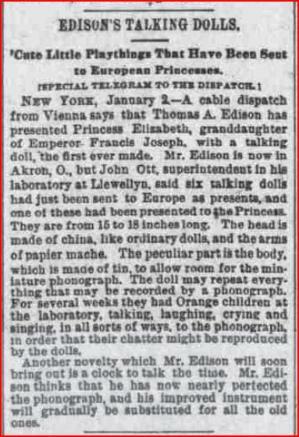 I truly believe it was Edison's idea to build this doll and Jacques was under contract to Edison to do so. 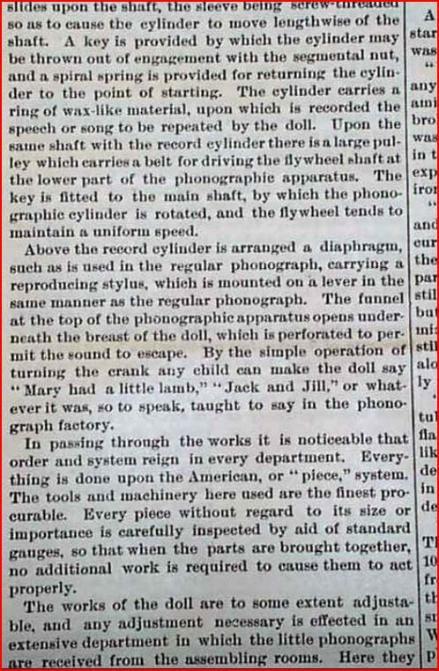 Phonograph & Doll factory talked about in the Scientific American news paper article above and in the many article on page #2.
piece of junk somebody was trying to dump, plus I wasn't sure it was an Edison doll. Live and Learn!!! 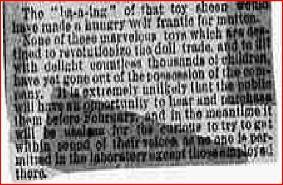 Maine as the toy company but the fact is this doll was built in Orange NJ in 1890. Fame. My point: Thomas Edison also invented the "Electric Chair" see how funny it is that nobody seem to what to take claim to it! was dissolved in October 1878 and in November the license was transferred to Hilbourne Roosevelt. Note: (below) This company is the one that says the dolls were made here but according to the news paper ads above they were made in Orange NJ not in Maine. 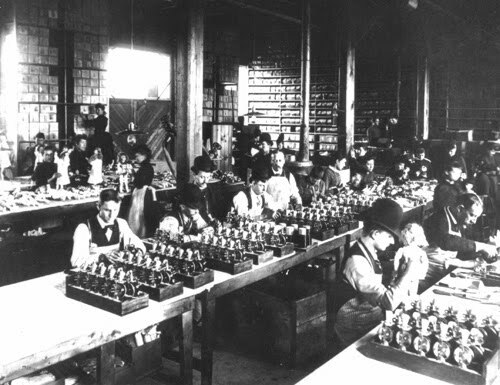 This company was incorporated in Maine in 1887 and maintained offices in Boston and New York. 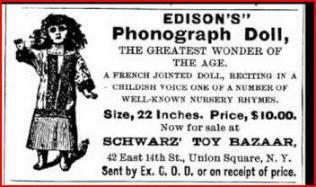 It sold phonograph dolls using Edison's phonograph patents. The business was closed in 1895. Note: (below) This is the company that is in the news paper ads above and is the one that actually built the dolls but this statement doesn't say anything about the doll. Manufacturing Company. In 1914 its factory was destroyed by fire but was quickly rebuilt. 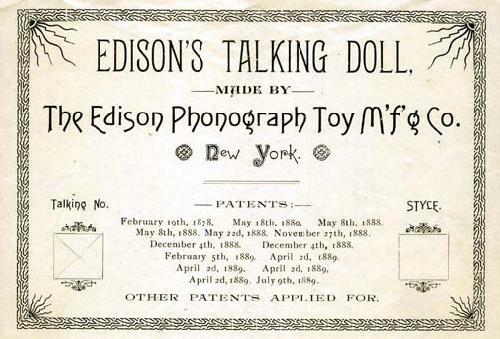 In 1924 the company became part of Thomas A. Edison, INC.
but it is an Original recording from one of his Dollphones. Click here to listen to "Twinkle, twinkle, little star"
means that the tin body was not made yet. 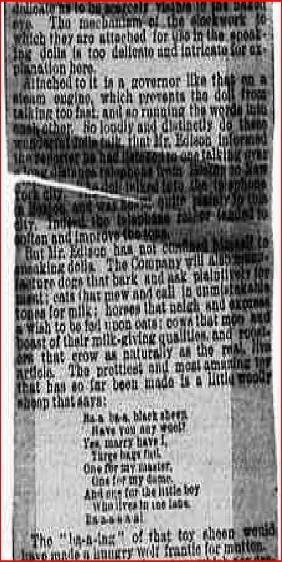 New York, New York Evening Sun Nov 22, 1888.
the same story but is different and from a different newspaper. It also is a partial story of the original one. Read both atricles below, they are the same but are different in parts. 42 East 14th St., Union Square, N. Y. 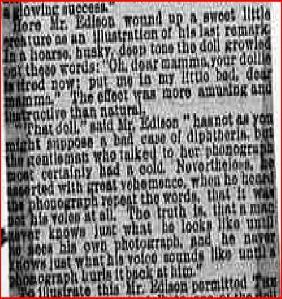 Note: Where he says on #12 "has Jacques resonator"
I read on the Thomas Edison Papers site that some of the every first pictures Edison ever took were of this doll but it didn't say if these were taken by him. she would be sold everywhere and how much she would cost. 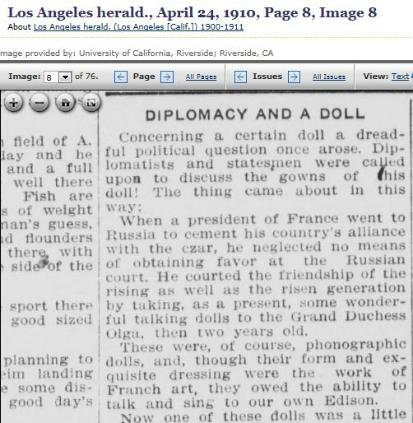 Article: Where talks about doll/figure Edison had made for a joke to have fun with his friends.